The Department of International Cooperation of the Ministry of Planning held a meeting with the representatives of the German Agency for International Cooperation (GIZ) on the project of developing the private sector and encouraging work in Iraq in the presence of the Director of the General Department and the heads of departments there as well as representatives of the Ministry of Higher Education and Scientific Research. 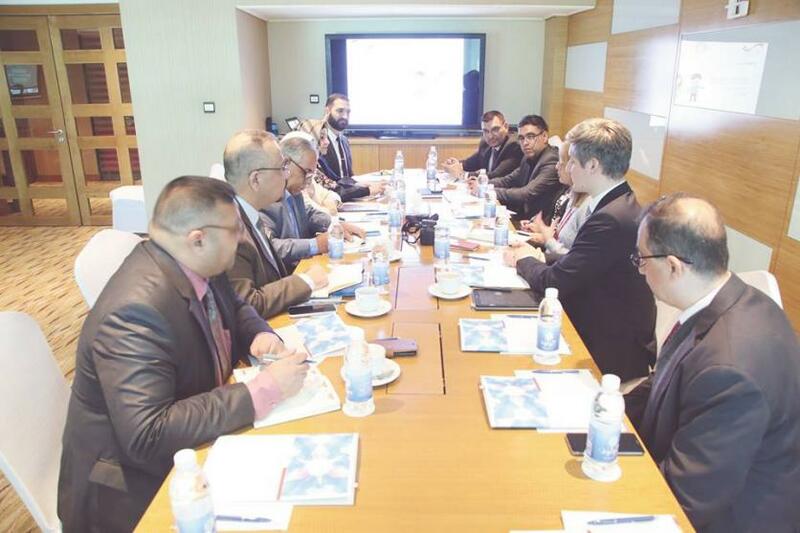 The Director of the Department of International Cooperation General Dr. Dham al-Azzawi: a meeting was held with the German Agency for International Cooperation (giz) to discuss their project to support the private sector in Iraq. "We suggested that the German organization hold a quarterly meeting every three months to clarify the progress of this project. Noting that the German Agency headed by Dr. Marcel Vinhoven, who provided a detailed explanation of the stages of development of their project in the provinces (Baghdad, Basra and Erbil). He stressed that: As a result of their success in training more than 4021 Iraqi trainees, the German government of the German Ministry of Planning has agreed to expand their training programs with Iraqi private sector companies, universities and the Ministry of Labor and Social Affairs represented in the vocational training centers and transfer this experience to Diwaniya province. He explained that the Ministry of Planning proposed that the project includes the provinces of Diyala and Anbar and also that the province of Nineveh is included because it is from the affected provinces where the proportion of unemployed and displaced also, adding that the proposal also ensures that this project is concluded by small projects through the selection of some successful trainees and competent and support To establish small projects that serve the labor market and also serve to alleviate poverty, withdraw unemployment, develop poor areas and perhaps even develop local areas in the provinces. For his part, Director of the German Agency for International Cooperation (giz) in Iraq, Dr. Marcel Vinhoven said that the project follows a two-component approach in the first component is supported by the economic transformation efforts of the Prime Minister's Office to allow a positive legislative and regulatory framework for the private sector, Decision-making and relevant committees to make policy decisions based on facts and implementable on trade and foreign investment, combating corruption and the business start-up environment. The second component targets the economic and social visions of young people, especially women, including returnees Improving their views in Iraq. The representative of the German Agency for International Cooperation (giz) and responsible for the implementation of the second component of the project on the promotion and development and creation of jobs in Iraq, Dr. Jafar Aslan: The meeting was to introduce the project to support and develop the private sector in Iraq to be implemented in cooperation between the German Agency and the Iraqi government represented by the Ministry of Planning as well as inform our political and executive partners to the objectives of this project and the achievements achieved by the end of 2018 in different areas. He added that the meeting also discussed the mechanism of cooperation and methodology followed by Project year 2019 for the next stage in collaboration with the Ministries of Labor and Social Affairs and Higher Education and Scientific Research. For his part, Assistant Director General of the Department of Studies and Planning and Follow-up at the Ministry of Higher Education and Scientific Research, Dr. Omar Mohammed Al-Ashari: The meeting with the German Agency for International Cooperation (giz), which provided us with a lot of useful programs in the subject of rehabilitation and employment of graduates and develop their skills as well as students; To review some of these programs and the objectives reached in this regard, stressing that it was also agreed on some of the fundamentals of the work during this year, will be cooperating with the German Agency in order to obtain the goal to develop the skills of students and graduates.